We help people to feel better every day in our office which is an amazing thing. However, we realise there are many with problems we can’t help. One of those is hunger. More often than not it’s children that suffer. Children going without food isn’t something I’m okay with. Between November 30th and December 10th 2015 we are offering free initial consultations in exchange for food donations. Food donations will be given to SVP who provide food and support to people within our community. The Society of St Vincent de Paul is the largest, voluntary, charitable organisation in Ireland with over 9,500 volunteers. They provide help and assistance to thousands of families throughout the year. By donating non-perishable food items or a hamper, you will be helping families and individuals enjoy a special Christmas. In addition, you will be easing some of their financial burden and giving them treats they might not buy themselves. Please ensure donated food is non-perishable and their expiry dates are well into next year. Perhaps you are new to the area and looking for a Chiropractor in Cork. Or maybe you’ve never been to a Chiropractor? This is the perfect opportunity to check us out. You will be improving your health while putting food on the table to people in need. 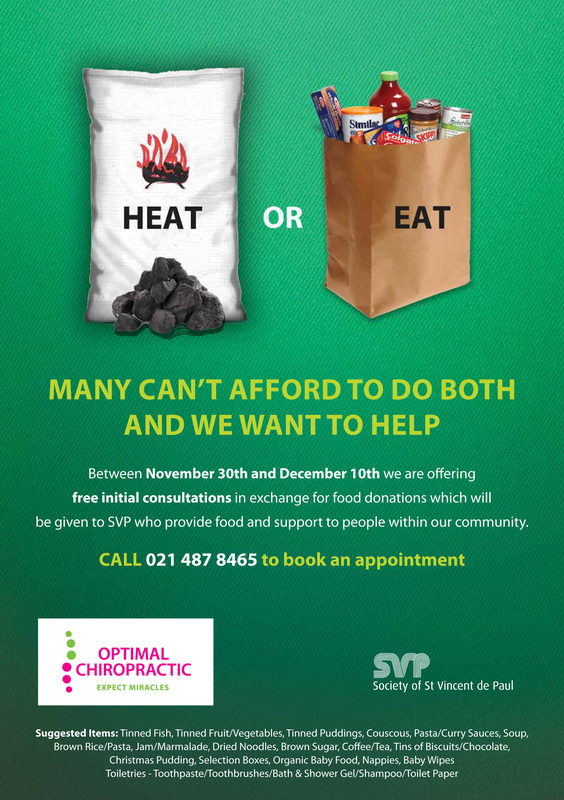 Simply give us a call at 021 487 8465 to make an appointment and bring a bag of food as your donation to SVP. Get Well and Stay Well with Optimal Chiropractic.